2013 La Spinetta, Il Rose di Casanova Della Spinetta, Tuscany, Italy. Giorgio Rivetti’s La Spinetta is one of Italty’s great wineries, his Cru Barbaresci are magical, and his Tuscan project is now reaching new heights as well, and for the last few vintages he has made one of the regions finest roses too. 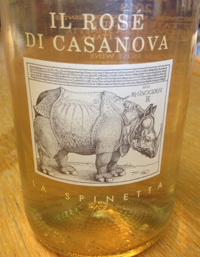 The Il Rose di Casanova Della Spinetta is a wonderfully crafted pink wine, made from local varietals though mostly Sangiovese, with dry austere character and shows vibrant freshness and delicacy with lots of spice, herb and mineral to go with citrus and melon fruits on the palate. This brisk and cool rose has hints of rose petal, basil, sour cherry, strawberry, steely minerals, grapefruit, peach and strawberry lifted by tangy acidity and is just perfect for a lunch outdoor lunch or pre dinner sipper. This golden orange/pinkish Tuscan rose from La Spinetta is a joyous and vivid wine with lots of restraint and class, each year it gets more and more stylish and refined, it certainly feels lively and has a more French tone than most roses from Italy which can be much bolder and heavy, but the Il Rose di Casanova Della Spinetta is in a class of it’s own, drink through the fall of 2014.